Netflix has revealed the receiver of its next golden ticket of content distribution partnerships, and it's TiVo! The DVR company is the latest team member of Netflix's ever expanding movie download empire, and subscribers to TiVo's Series3, HD, and HD XL sets can now stream cinema directly to their TVs. And from this screenshot, its apparent that you can browse titles instead of having to queue them up on a PC first. This is much better than the Netflix-Tivo venture they put forth over a year ago and more like our wishes for a Tivo-Netflix marriage over a year ago. TIVO AND NETFLIX ANNOUNCE PARTNERSHIP TO INSTANTLY STREAM MOVIES AND TV EPISODES FROM NETFLIX DIRECTLY TO THE TV THROUGH TIVO DVRs Deal Provides Netflix with New Content Distribution Channel, Solidifies TiVo's Leading Position as One-Box Solution for Simple Navigation and Delivery Of the Best Entertainment Content to the TV ALVISO, Calif. and LOS GATOS, Calif., October 30, 2008 - TiVo Inc. (NASDAQ: TIVO), the creator of and a leader in television services for digital video recorders (DVRs) and Netflix, Inc. (NASDAQ: NFLX), the world's largest online movie rental service, today announced that they are teaming up to provide Netflix and TiVo® Series3, TiVo HD, and TiVo HD XL subscribers with the ability to have thousands of movies and TV episodes instantly streamed from Netflix directly to their TVs. The two companies said they are initiating a test of the new capability today in several thousand U.S. households and expect it to be broadly available in early December, in time for the holidays. The ability to instantly watch content from Netflix on the TV via TiVo DVRs will be offered at no additional charge to customers who subscribe to both services. The agreement provides Netflix with an important new technology partner to instantly stream a growing library of more than 12,000 choices of movies and TV episodes directly from Netflix to the TV. It also solidifies TiVo's leading position for simple navigation and delivery of the best entertainment content to the TV. "For Netflix and TiVo subscribers, this collaboration offers a fabulously easy way to enhance the enjoyment of watching movies in the comfort of their living rooms," said Reed Hastings, co-founder and CEO of Netflix. "Subscribers to Netflix and TiVo are avid movie watchers and this combination gives them immediate access to all of the great content available through TiVo and the thousands of additional choices available to be streamed instantly from Netflix." "Joining forces with Netflix creates the ultimate video on demand service and solidifies TiVo's leading position as the one-box solution for aggregating, searching, and delivering the best content available anywhere right to the TV," said Tom Rogers, president and CEO of TiVo Inc. "Adding Netflix to our already vast library of content differentiates TiVo even further from any other offering in the market today." Integrating the Netflix streaming functionality into the TiVo experience will result in quick and easy access to a growing list of movies and TV episodes that can be watched instantly at Netflix. Movies streamed from Netflix via specified TiVo DVRs is done through a wired or wireless broadband connection and a Netflix Queue-based user interface. 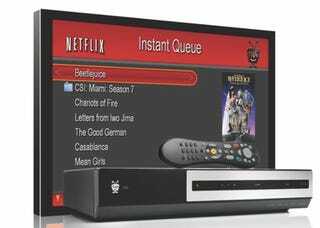 Members visit the Netflix Web site to add movies and TV episodes to their individual instant Queues. Those choices will automatically be displayed on subscribers' TVs and available to watch instantly through the TiVo service. With the TiVo remote control, users will be able to browse their instant Queue, make selections right on the TV screen, and also have the ability to read synopses and rate movies. In addition, they will have the option of pausing, fast-forwarding, rewinding and re-starting whenever they wish. For more information on how to have movies instantly streamed from Netflix via your TiVo DVR visit www.tivo.com/netflix.